An innovative, web-based application, created to enable organizations and social enterprises to gather and develop the wealth of knowledge that resides within. When facing complex issues, with the accelerating factor of an uncertain future, effective development of “collective intelligence” of ALL of our staff and allies is the rational path. Everyone knows more than anyone. We need everyone to explore the parameters of a specific issue or problem if we want to optimize our resilience and nurture initiative-taking and innovation. 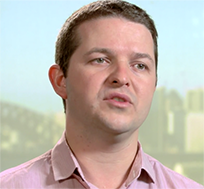 The WindTunneling Effect surpasses traditional risk-assessment consultanting or software. It allows all levels and silos of an organization to offer insights, ideas and knowledge on a level playing field, to be considered equally. Participants share ideas anonymously and feel safe to speak out: this enables the group to quickly get to the crux of issues and identify patterns and emergent new options for improvement. The results of a WindTunneling project informs the design of strategic planning or resilience-testing activities. Participating empowers the entire organization to trust its ability to adapt to constant and accelerating change. In these two short videos we aim to help you understand the relationships between the technology, the facilitator, and the participants of a WindTunneling project, and how powerful this combination can be. 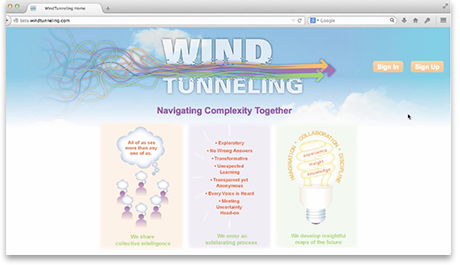 WindTunneling is currently being used by a California state agency to include all of its staff around the state, at all levels, in the various steps of their strategic planning process. In many large, diverse inner-city communities trust has broken down and police legitimacy is questioned. WindTunneling is being used to bring parties together, sharing needs and ideas of what might make a difference. Everyone gets to see every idea: no one knows who share which idea. We can’t generalize or rely on our prejudices or on “Us v Them” perception and thinking. WindTunneling lets us start at a different place and prepare for face-to-face meetings that can be productive and more safe. Because complex issues are so varied, as social architects, we’ve designed WindTunneling to be non-linear and as flexible as elastic thread. Simultaneously, it is as disciplined as an Olympic athelete. Magic? No, but WindTunneling evolved and has existed for over two decades: only in the past four years has it taken on the benefits and burdens of a virtual life. Ironically, our design using technology enables us to to be more human as opposed to less human. We are able to “hear” each other in ways that conventional group processes block. We are able to use time to think through new ideas without the pressure of seven people at our table waiting for us to say something. Time becomes our friend. Our higher purposes include giving a voice to those who do not have a voice today. Our experience is that we need every perspective and voice to inform our options if we are to design and craft a future that will stand up to the challenges we face. A CORPORATION is a social form. A COOPERATIVE is a social form. A BOOK is a social form.